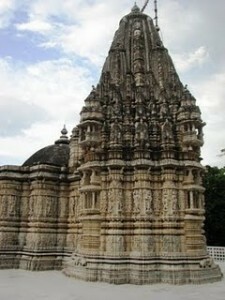 Hindu and Jain temples makes up the Western Group, which lies close to the Khajuraho village. 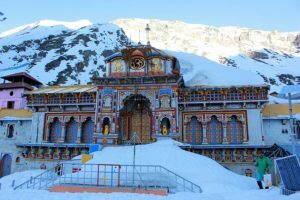 The largest Jain temple, Parswanath, is in this group. Exquisite in detail the sculptures on the northern outer wall make this temple perhaps the finest in the group. 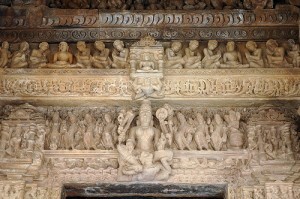 The themes of these carvings are the timeless ones of every day, mortal activity. A woman sits bent pensively on a letter, a lovely young girl removes a thorn from her foot, the master craftsmen of Khajuraho display here their deep understanding of the trifles that make pup a human life. Within, the sanctum has a throne, which faces a bull: emblem of the first tirthankara, Adinnath. The actual image of Parswanath from which the temple derives its name was installed as recently as 1860. The other Jain temple in this group is this group is the Ghanbtai Temple. Though almost in ruins now, it still bears evidence of its original splendour. The three Hindu temples in the Eastern Group are the Brahma, Vamana and Javari Temples. A double row of apsaras, celestial nymphs, adorns the outer walls of the Vamana temple. A double row of apsaras, celestial nymphs, adorns the outer walls of the Vamana temple. A variety of sensuous attitudes: languid, provocative, mischievously inviting, give credibility to the theory that Khajuraho’s erotica were meant to test the devotees who came to worship their gods at the temples. This entry was posted in Madhya Pradesh, Parswanath and tagged parsvanath temple, Temple. Bookmark the permalink.